Our Stud Girdles are engineered for high pressure springs, high lift cams or turning big rpm. They support and strengthen your rocker studs keeping valvetrain deflection to a minimum which could cause lost horsepower or even worse, component failure. They also provide fewer valve-lash adjustment sessions. Machined from billet aluminum for maximum strength and anodized in a clear finish. Includes adjusting nuts. 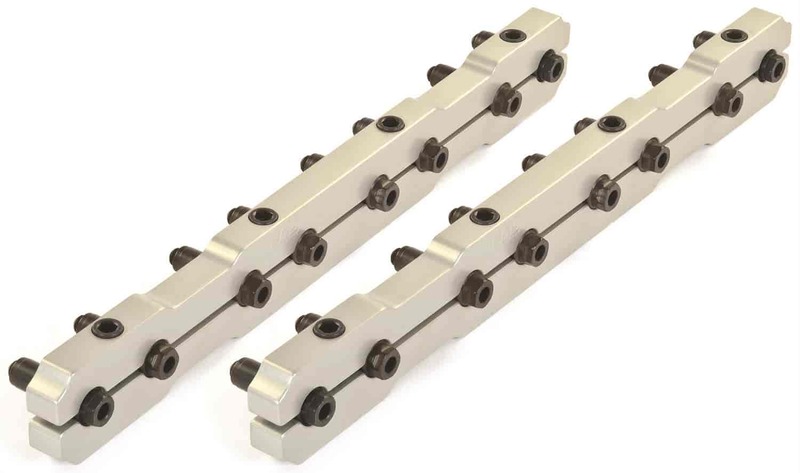 For use with 0.600" slot rocker arms. Does JEGS 20515 fit your vehicle? 20515 - JEGS Stud Girdles is rated 5.0 out of 5 by 2. Rated 5 out of 5 by grouchy gremlin from thumbs up!!! great part- great price will need tall valve covers to install though. Rated 5 out of 5 by jegs from Nice product Fit very well. Because of the bulk of my aluminum rockers, I had to clearance the bottom of the girdle on the valve side. Will these work on Brodix Track 1 heads? I need .6 not .58 diameter on the bottom of the adjusting nut. What size are these? These will be .580&quot; so that they fit a .600&quot; slot in the rocker arm. Will these fit eldelbrock aluminum heads for Pontiac 400 ?